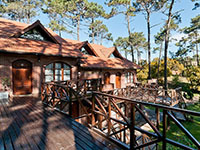 Cariló, in the south extreme of Pinamar Partido, is a star of first magnitude in the argentine tourist range. Famous for its rare combination of sea and woods, Cariló adds to its beauty, the urban development, planned in a way that privileges the style which is today conserved by the place, providing, like the rest of the Partido, the essential things to create one of the best tourist options of the country, due to the magic of the place, the excellence of the lodging and services’ offer. 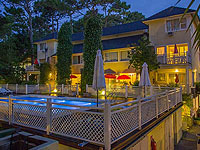 This high-level tourist centre has a wide variety of Hotels, Hostelries, Apart Hotels, Cabins and Resorts &Spa, most of them near the beach. 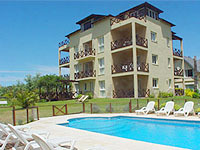 Excellent bathing resorts that extend the tourist pleasure till the night, with all kind of activities and events. Those who like golf will be able to enjoy Cariló Golf Club during the whole year, where, year after year, some national and international tournaments are organized. Another typical activities offered in Cariló are the horse rides and the diurnal and nocturne four-track trips. Cabañas en Cariló. Información detallada, imágenes, precios y descuentos de Cabañas en Cariló. Excelentes ofertas de Cabañas en Cariló. Detalles e información de alojamientos en la ciudad de Cariló. Cabañas , Aparts y spa para disfrutar de las vacaciones junto a toda la familia. Consulta los precios de cabañas en Cariló. Tenemos el listado más amplio de Cabañas y Aparts baratos en Cariló y alojamientos de primera categoría. Además, información de excursiones, paseos y rutas gastronómicas.